Listed at 91" on the bag and 86" on their website. Wind range listed at 3-20 mph. Realistically, I'd say more like 6 mph, at least up here in Las Vegas. Flown stock except for the standoff positions. I have now flown the Dream On, Cross Fire and Sweet Emotion. The cheapest of the 3, the Dream On flies the best but is the least tricky. As you go up in price you get a trickier kite with better nose treatment and reinforcement and better materials. Construction: The Sweet Emotion is a high aspect ratio, weighted kite. The lower spreaders are Dynamic 18s, didn't check the rest of the frame. This is a relatively heavy, very taut sailed kite. There is reinforcement where it should be. The nose is very well executed and the construction overall is pretty good. I'm not an expert in construction. The keel has 2 brass weights around the spine. When the standoffs are inserted into the connectors, the lower spreader bends several inches and the lower spreader connectors twist outward to relieve some of the bending stress. After pushing the connectors back a few times, I ended up slanting the standoffs toward the center-T about 30° to back off the pressure. The LS connectors still rotated a little, but there was never any issue of the spreaders coming unseated. Visually: I like the look of the kite. The grey on the wingtips doesn't follow the lines of the grey in the rest of the kite. I noticed it but didn't find it bothersome. The grey has a jet plane profile to it and the black laid over the kite works in my eyes. Precision: Not really. The less expensive Dream On actually had fairly nice precision and was quite well mannered. The Cross Fire and Sweet Emotion are more trick oriented. The Sweet Emotion has a fairly tight spin radius, which I prefer for tricks. The kite became solid around 6 mph and fast by 10 mph. I'd be surprised if anyone would want to try this kite above 15 mph. But that is pretty normal for a standard at any price. There was no noise from the kite at any time. Tricks: The SE feels like it is one solid thing. The sail feels taut although there is a little motion when you shake the kite. Everything trickwise happens quickly. The weight of the frame and keel rings makes the kite flip quickly. My timing was off as I am not use to this weight, but I was able to do my limited tricks easily. Spin tricks aren't particuarly nice looking, but they are very easy to do. Cascades, half axels, slot machines, Taz machines were there. What surprised me was how easy it was to roll up the kite in the forward direction. I didn't know what to do after the kite wound up because I almost never get a forward roll up. But the SE was pretty straightforward in its ability to pitch in either direction. At the same time, the kite didn't instantly fall on its back like a lot of pitch happy tricksters. It would start to go back when tension was released, but not nearly as bad as others I've flown. Summary: For $180, you get a well made trickster with an outstanding nose finish and a pitch oriented, high aspect flippy attitude. 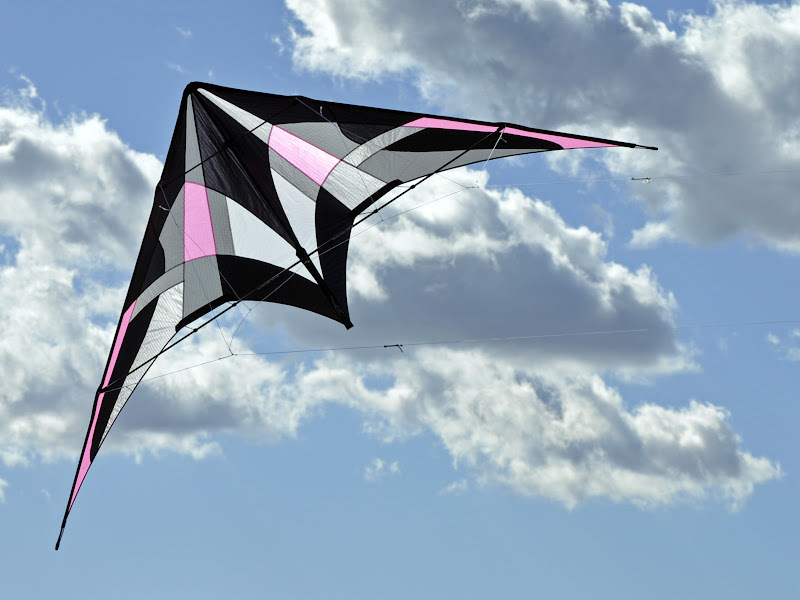 There are many on this Forum who are better trick fliers than myself who would like this kite. That's 3 for 3 from Dodd and Skydog. For the money they are all a good deal. dynamic rods??? do you think it was made in the flying wings factory??? Most Flying Wings kites are NOT made in their factory, but outsourced to a mainland China facility. I believe the Soul and the Prediction are made by Flying Wings in Taiwan. The Soul and Prediction are very nice and well made kites. Chilese, thank you for all the reviews you've written. They've been very helpful to me in my search for my first trick stunt kite. I currently own a Skydog Little Wing, Prism Snapshot 1.2 and Prism Micron. All great kites, but can't learn tricks with any of them. My price range has been $50, but now I'm looking towards a $110-150 large kite since I've got bitten by the kiting bug. This Sweet Emotion kite and the Cross Fire are especially interesting to me, both in cost and performance. I wanted to ask, what is the difference between the two? The specs seems to be exactly the same. Also, after 4 years, how are these two kites holding up? 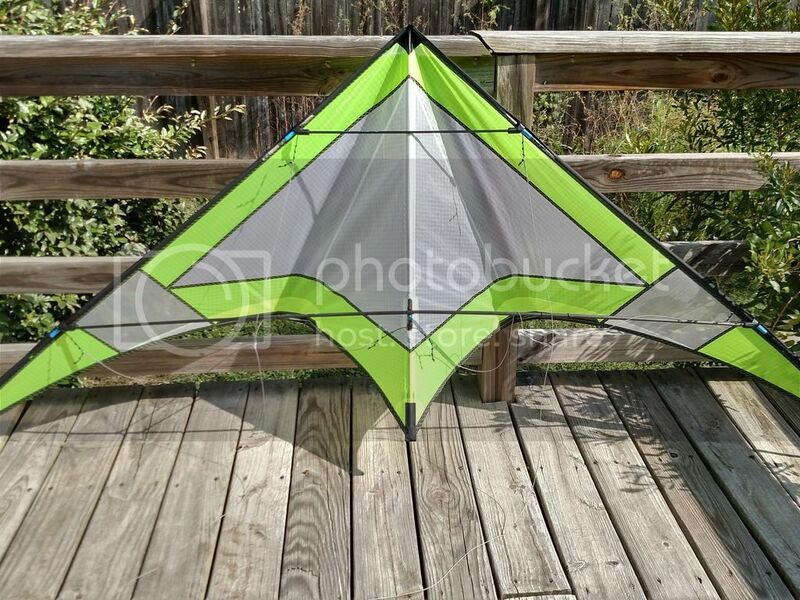 Would you recommend these two kites for a someone comfortable with stunt kites and wants to get into tricking? Thank you for any answers you can provide! Oh and I love your Picasa albums, I viewed the 2013 kites album, and it was amazing. Thank you for that as well! I see, thanks for your response. I'm able to purchase the Sweet Emotion online and I like the design better. When you tested both, was there any difference between the Sweet Emotion and the Cross Fire? Or are they really the same kite, but rebranded? There are quite a few still in production that can trick and are very capable at precision. The Saber II & III (by Sturdy Kites and one of my favorites), the Nirvana, the Sixth Sense ( favorite homebuild) are the most popular right now. I have seen videos of several other European kites that are quite capable (Veyron, Hugo, etc.) There are more, I'm sure others will chime in. At competitions you will see some other popular kites that are not currently in production (CDC STX and Shiva, Vendetta, Machine, Jinx by Focus). The Skyburner Solus is a nice big precision kite with excellent trick capability. The Prism Quantum Pro is an excellent kite for precise flying. Used by world class teams. The underseen Flying Wings Prediction (2.4m) fits into the great flier category. It comes in standard and UL and is very well made. I flew both for "A Wind Of Change" testing. Don't know the price, but it's a true team kite also. I have a Quantum Pro (2 actually) and a STX2.3. Really solid fliers. Glad to see there are still some kites for the non-tricksters like me. Thanks for the input.